Canada’s Economic Action Plan is working. Since the beginning of the recovery, the Canadian economy has continued to create jobs, with over 1 million more Canadians working today than during the worst part of the recession—the best job creation record of any Group of Seven (G-7) country over the period (Chart 1.1). Despite significant global weakness emanating in particular from the United States, our largest trading partner, the Canadian economy has continued to expand modestly, enjoying one of the best performances among G-7 countries over the recovery. Note: Monthly data for Canada (July 2009 to January 2014), the United States (February 2010 to January 2014), Germany (July 2009 to December 2013), Japan (December 2012 to December 2013) and Italy (at its lowest as of December 2013). Quarterly data for France (2009Q3 to 2013Q3) and the United Kingdom (2010Q1 to 2013Q3). Sources: Haver Analytics; Department of Finance calculations. However, Canada is not immune to external developments. Canada’s economy has been restrained by weak export markets and declines in commodity prices. Indeed, the risks to global growth that have lingered throughout the recovery are still present. Financial market vulnerabilities in some emerging economies could translate into weaker-than-expected growth and increased financial market volatility more broadly. This could place additional stress on the euro area, where growth remains lacklustre. Furthermore, volatility in commodity prices remains a risk to the outlook. Given the ongoing uncertainty in the global economic environment, it is important for the Government to continue to pursue the objectives of job creation and economic growth that have underpinned the Economic Action Plan since its inception in 2009, while remaining on track for balanced budgets. Equipping Canadians with the skills and training they need to succeed in the labour market, while also connecting them to available jobs. Supporting advanced research and innovation to foster a vibrant entrepreneurial culture where new ideas are translated into products and services in the marketplace. Reducing red tape and the regulatory burden faced by businesses. Helping to develop natural resources in a responsible and secure way. Helping businesses succeed in the global economy by encouraging trade and foreign investment to support our manufacturing sector and diversify our exports. Investing in public infrastructure, including by creating a new Building Canada plan—the largest long-term federal investment in infrastructure in Canadian history. The Government has further supported the economy by keeping taxes low—in order to maintain the best economic environment possible for Canadians and Canadian businesses to prosper. The Government has pursued this goal by implementing both broad-based tax cuts and targeted tax relief for individuals, families and businesses since 2006. Canada has experienced the strongest job growth among the G-7 countries over the recovery. Over 1 million more Canadians are working now than at the end of the recession, with the vast majority of new jobs being full-time, high-wage, private-sector positions. Real gross domestic product (GDP) in Canada is significantly above pre-recession levels—one of the best performances in the G-7. 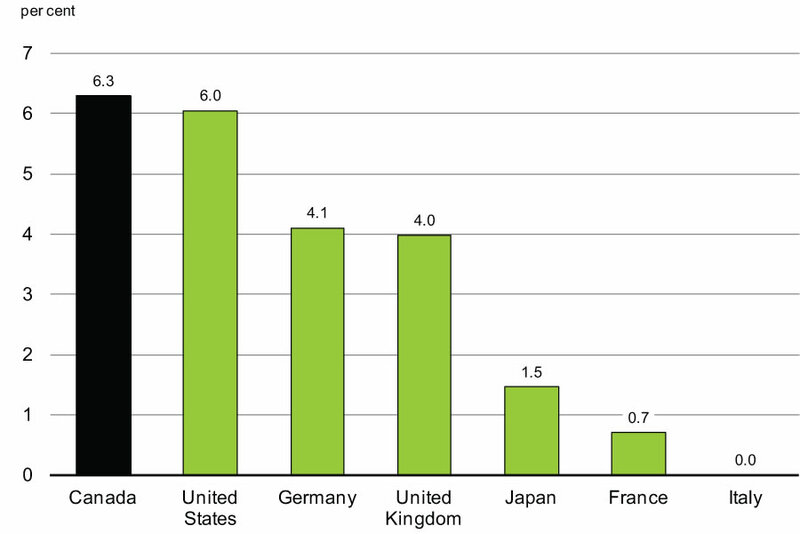 Canadians have experienced the strongest real per-capita income growth in the G-7 since 2006. Both the International Monetary Fund (IMF) and the Organisation for Economic Co-operation and Development expect Canada to be among the strongest-growing economies in the G-7 over this year and next. Canada’s business investment performance has been the strongest by far in the G-7 during the recession and recovery. For the sixth year in a row, the World Economic Forum rated Canada’s banking system as the world’s soundest. Canada is the only country in the G-7 to receive a triple-A rating with a stable outlook from all the major credit rating agencies. This year, Canada leapt from sixth to second place in Bloomberg’s ranking of the most attractive countries for business. Growth in foreign direct investment into Canada has been the strongest among the G-7 countries over the recovery. Government of Canada securities are among the world’s most sought-after investments. Indeed, the Canadian dollar is now one of the reserve currencies tracked by the IMF, alongside the U.S. dollar, the euro and the Swiss franc. 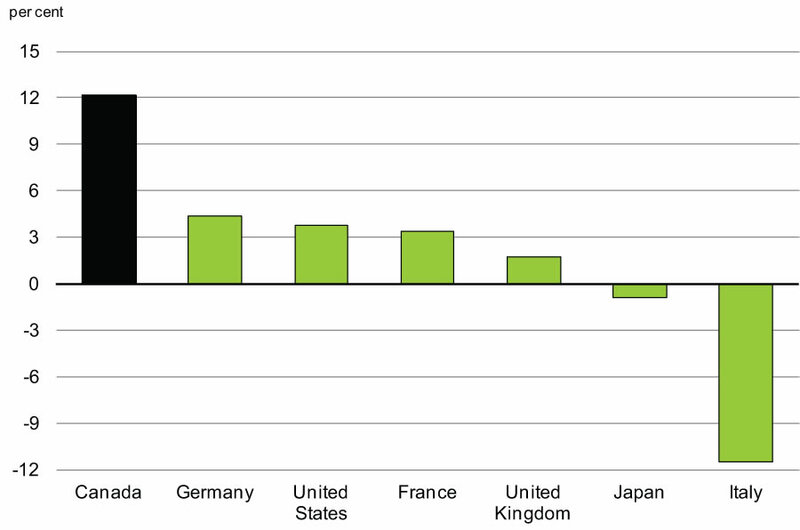 Canada has the lowest net debt-to-GDP ratio, by far, of any G-7 country. Actions taken by the Government since 2006 have helped the Canadian economy enjoy the strongest performance in the G-7, with almost 1.6 million new jobs created since the beginning of 2006. 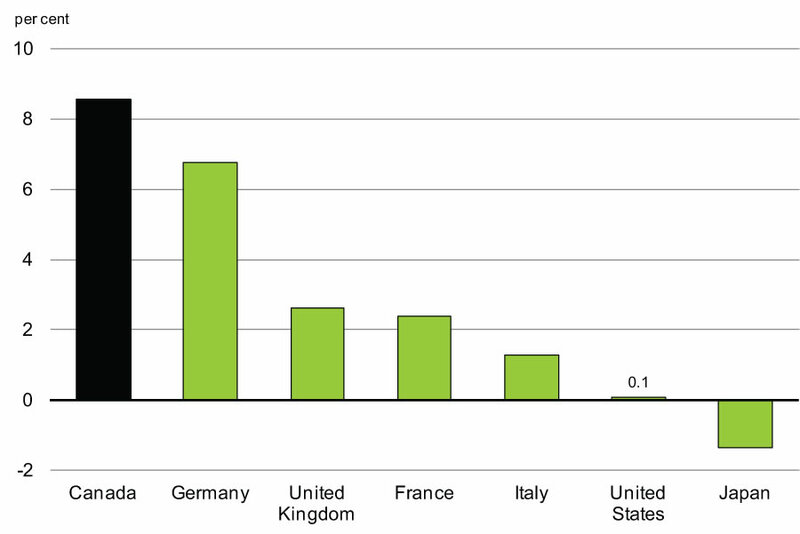 In addition, Canadians have enjoyed the strongest income growth in the G-7 by far (Chart 1.2). Indeed, Canadian families in all income groups have seen increases of about 10 per cent or more in their real after-tax, after-transfer income since 2006. Note: Base year for calculations is 2005. Notes: This chart shows gross personal per capita disposable income deflated by the Consumer Price Index. The last data point is 2012 for all countries. Base year for calculations is 2005. Sources: Haver Analytics; IMF; Department of Finance calculations. Supporting families and communities by taking additional steps to protect Canadian consumers; keeping taxes low for families; and improving the safety of Canadians. The Government’s efforts to support jobs and growth are underpinned by its plan to return to balanced budgets in 2015. This commitment to fiscal responsibility has helped to ensure that Canada maintains its hard-earned international economic and fiscal advantage, which will help foster a growing, healthy economy that creates stable, well-paying jobs for Canadians. Indeed, the Government’s plan to return to balanced budgets is not an end in itself, but a means to increase Canada’s economic potential, improve employment opportunities for Canadians and raise our standard of living. It is for this reason that the Government has made returning to balanced budgets the cornerstone of its Economic Action Plan. Economic Action Plan 2013 reformed the skills training system to better help Canadians acquire the skills that will get them hired or help them get better jobs. Better aligns training with labour market needs through the Canada Job Grant. Introduces a new generation of Labour Market Agreements for Persons with Disabilities. Over the next four years the Government will provide $222 million annually through these transfers, to be matched by provinces and territories, to better meet the needs of persons with disabilities and employers. Connects persons with developmental disabilities with jobs through the Ready, Willing & Able initiative and supports the creation of vocational training centres for persons with Autism Spectrum Disorders. Creates the Canada Apprentice Loan by expanding the Canada Student Loans Program to help registered apprentices in Red Seal trades with the costs of training and introduces the Flexibility and Innovation in Apprenticeship Technical Training pilot project to expand the use of innovative approaches for apprentice technical training. Focuses federal investments in youth employment to provide real-life work experience in high-demand fields. Provides an additional $40 million to the Canada Accelerator and Incubator Program to help entrepreneurs create new companies and realize the potential of their ideas through intensive mentoring and other resources to develop their business. Invests to reform the on-reserve education system, in partnership with First Nations, through the First Nations Control of First Nations Education Act. Renews and expands the Targeted Initiative for Older Workers for a three-year period, representing a federal investment of $75 million to assist unemployed older workers. Provides $11.8 million over two years and $3.3 million per year ongoing to launch an enhanced Job Matching Service to ensure that Canadians are given the first chance at available jobs that match their skills in their local area. Invests $11.0 million over two years and $3.5 million per year ongoing to strengthen the Labour Market Opinion process to ensure Canadians are given the first chance at available jobs. Provides $14.0 million over two years and $4.7 million per year ongoing towards the successful implementation of an Expression of Interest economic immigration system to support Canada’s labour market needs. Not introducing new taxes on business. Further reducing barriers to the international and domestic flow of goods and services. Moving forward with the planning for and construction of a new Windsor-Detroit International Crossing to improve the flow of people and goods between Canada and the United States. Creating the new Canada First Research Excellence Fund with $1.5 billion in funding over the next decade to help Canada’s post-secondary institutions excel globally in research areas that create long-term economic advantages for Canada. Providing an additional $500 million over two years to the Automotive Innovation Fund to support significant new strategic research and development projects and long-term investments in the Canadian automotive sector. Modernizing regulation and legislation to better protect investors and taxpayers, enhance Canada’s financial services sector and support efficient capital markets. Providing $28 million over two years to the National Energy Board for comprehensive and timely reviews of project applications and to support the Participant Funding Program. Continuing to support the forestry, mineral exploration and agriculture sectors. Asserting Canada’s sovereignty in the North. Investing new resources to protect Canada’s rich natural heritage. Economic Action Plan 2014 also proposes to make strategic investments in public infrastructure and transportation services across Canada, including in major bridges, small craft harbours and ports, and ferry services. Supports Canadians by advancing the Government’s Consumers First Agenda and better protecting financial consumers. Invests $305 million over five years to extend and enhance broadband internet service for Canadians in rural and Northern communities. Keeps taxes low, helps make adoption more affordable for Canadian families and provides further tax recognition of health-related expenses. Helps communities and workplaces by taking additional steps to support the charitable sector, improve the health of Canadians, support our arts and cultural communities, and honour our veterans. Takes action for Canadians in need, for example by helping Canadians prepare for and recover from natural disasters and by introducing a Search and Rescue Volunteers Tax Credit in recognition of the important role played by these volunteers. Proposes measures to improve the health and safety of Aboriginal communities, including investments in water infrastructure and efforts to reduce violence against Aboriginal women and girls. 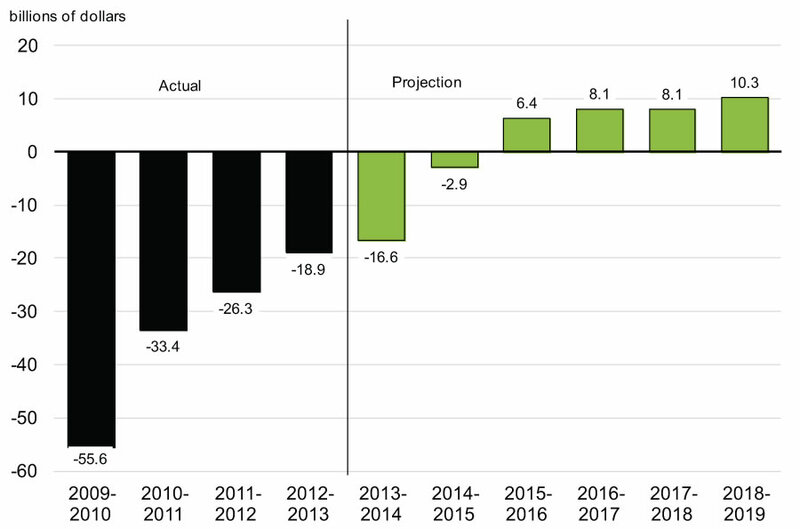 The Government’s plan to return to balanced budgets in 2015 has been driven by strong financial management and restraining the growth of departmental spending. Since Budget 2010, the Government has implemented a number of targeted actions and broad-based reviews to reduce the operating and administrative expenses of federal departments, without compromising the delivery of priority services to Canadians. These measures have been augmented by the adoption of initiatives designed to improve the integrity, fairness and neutrality of the tax system and to ensure that everyone plays by the same rules, which in turn helps to keep taxes low for hard-working Canadians. Intends to transition from currently paying 75 per cent of benefit costs to equal cost sharing for retired federal employees who choose to participate in the Public Service Health Care Plan, as well as to increase the minimum years of service required to be eligible for the plan. Will enter the 2014 round of negotiations with collective bargaining agents with the policy priority to implement a disability and sick leave management system that is modern, comprehensive, and responsive to the needs of all employees. Taking into account the above savings measures, and the adjustment of National Defence funding for major capital procurements into future years in which key purchases will be made, direct program spending in Economic Action Plan 2014 is projected to remain broadly in line with its 2010–11 level over the forecast horizon. In contrast, federal transfers to individuals that provide important income support, such as Old Age Security, and major transfers to other levels of government for social programs and health care will continue to grow over the forecast horizon. Economic Action Plan 2014 also proposes a number of measures that reflect the Government’s ongoing commitment to improving the fairness and integrity of the tax system and ensuring that everyone pays their fair share. The Government is on track to return to balanced budgets in 2015. The deficit has been reduced by almost two-thirds since the height of the global economic and financial crisis, from $55.6 billion in 2009–10 to $18.9 billion in 2012–13. Looking forward, including the measures announced in Economic Action Plan 2014, the Government expects to realize a surplus of $6.4 billion in 2015–16, after taking into account the $3.0-billion annual adjustment for risk (Chart 1.3). Sources: Public Accounts of Canada; Department of Finance. Returning to a balanced budget in 2015 will help ensure that the federal debt-to-GDP ratio remains on a downward path (Chart 1.4). Lower debt levels mean lower debt-servicing costs, which will result in lower taxes for Canadians and a strong, stable investment climate that supports job creation and economic growth. At the G-20 Leaders’ Summit in St. Petersburg, Russia, last September, Prime Minister Stephen Harper announced Canada’s commitment to achieve a federal debt-to-GDP ratio of 25 per cent by 2021. 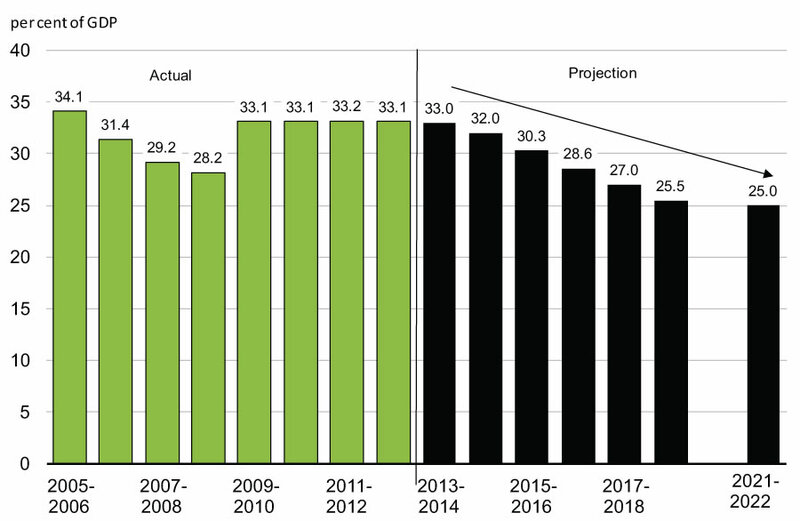 The return to balanced budgets in 2015 will significantly contribute to reducing Canada’s federal debt-to-GDP ratio to below its low, pre-recession level by 2017–18, putting the Government well on its way towards achieving its target of 25 per cent of GDP by 2021. Sources: Public Accounts of Canada; Statistics Canada; Department of Finance. Implementing policies focused on raising Canada’s economic potential and creating stable, well-paying jobs continues to be the Government’s top priority. Economic Action Plan 2014 takes additional steps to achieve these objectives, especially returning to budget balance in 2015. Maintaining focus on these priorities is the best way to ensure that Canada is prepared to weather any future economic storm that may arrive from outside our borders. It is also the best way to ensure that Canada’s future is a prosperous one, with a healthy, competitive economy fuelled by low taxes, and government services that are sustainable for generations to come. The Canadian economy has experienced one of the best performances among the Group of Seven (G-7) countries over the recovery in terms of both output and job creation. Over 1 million more Canadians are working now than at the end of the recession, the strongest job growth among G-7 countries over this period. Business investment has fuelled growth over the recovery and Canada’s business investment performance has been by far the strongest in the G-7 during the recession and recovery. However, Canada is not immune to developments from beyond our borders, which have translated into weak export markets, lower commodity prices and low inflation since early 2012. Private sector economists, surveyed by the Department of Finance in early December 2013, expect real gross domestic product (GDP) growth to strengthen and economy-wide price inflation to pick up in 2014 and 2015, resulting in an improvement in nominal GDP growth from its modest pace of 3.2 per cent in 2013. Private sector economists agree that risks to the outlook remain tilted to the downside but have lessened since the November 2013 Update of Economic and Fiscal Projections, reflecting recent positive developments in the United States. For fiscal planning purposes, the Government is maintaining the downward adjustment of the private sector forecast for nominal GDP to reflect continued risks to the global economic outlook. Aligning training with labour market needs through the Canada Job Grant. Introducing a new generation of Labour Market Agreements for Persons with Disabilities to better meet the needs of persons with disabilities and employers. $15 million over three years to connect persons with developmental disabilities with jobs through the Ready, Willing & Able initiative of the Canadian Association for Community Living. $11.4 million over four years to support the expansion of vocational training programs for persons with Autism Spectrum Disorders. Creating the Canada Apprentice Loan by expanding the Canada Student Loans Program to help apprentices registered in Red Seal trades with the cost of training. Providing an additional $40 million to the Canada Accelerator and Incubator Program to help entrepreneurs create new companies and realize the potential of their ideas through intensive mentoring and other resources to develop their business. Introducing the Flexibility and Innovation in Apprenticeship Technical Training pilot project to expand the use of innovative approaches for apprentice technical training. Focusing federal investments in youth employment to provide real-life work experience in high-demand fields. Eliminating the value of student-owned vehicles from the Canada Student Loans Program assessment process to better reflect the needs of students who commute or work while studying. Investing to reform the on-reserve education system, in partnership with First Nations, through the First Nations Control of First Nations Education Act. Renewing the Computers for Schools Program to provide students and interns with access to information and communications technology equipment and skills training. Investing $75 million over three years to assist unemployed older workers by renewing and expanding the Targeted Initiative for Older Workers program. Investing $11.8 million over two years and $3.3 million per year ongoing to launch an enhanced Job Matching Service to help connect Canadians with available jobs. Investing $11.0 million over two years and $3.5 million per year ongoing to reform the Temporary Foreign Worker Program to ensure that Canadians are given the first chance at available jobs. Investing $14.0 million over two years and $4.7 million per year ongoing towards the successful implementation of an Expression of Interest economic immigration system to support Canada’s labour market needs. Maintaining a low tax burden on businesses with no new taxes. Reducing the tax compliance burden for small and medium-sized businesses and other tax filers. Maintaining the freeze on Employment Insurance premium rates to help provide certainty and flexibility for employers, especially small businesses. Continuing to ensure that Canadian businesses and investors have the market access they need to succeed in the global economy. Modernizing Canada’s intellectual property framework to better align it with international practices and reduce the administrative burden for innovative Canadian businesses. Consulting on a “Made-in-Canada” branding campaign to raise consumer awareness of the quality and range of Canadian-made products both domestically and internationally. Taking steps to strengthen internal trade, including the development of an Internal Trade Barriers Index to identify measures currently restricting trade, and help all jurisdictions in focusing reforms and negotiation efforts on priority areas. Creating the new Canada First Research Excellence Fund with $1.5 billion in funding over the next decade to help Canadian post‑secondary institutions excel globally in research areas that create long-term economic advantages for Canada. Providing new funding of $46 million per year for the granting councils to support advanced research and scientific discoveries, including the indirect costs of research. Providing an additional $500 million over two years to the Automotive Innovation Fund, to support significant new strategic research and development projects and long-term investments in the Canadian automotive sector. Implementing measures to increase market discipline in residential lending and reduce taxpayer exposure to the housing sector. Taking action to encourage competitive financial services while preserving the safety and soundness of the financial sector. Modernizing regulation to better protect investors, enhance Canada’s financial services sector, support efficient capital markets and manage systemic risk. $28 million over two years to the National Energy Board for comprehensive and timely reviews of project applications and to support the Participant Funding Program. Expanding the types of farming livestock that qualify for tax deferral on sale by farmers dealing with extreme weather conditions. Exercising Canada’s sovereignty over the North by securing international recognition of the limits of Canada’s extended continental shelf, including the North Pole. $40 million over two years, starting in 2014–15, to renew the Strategic Investments in Northern Economic Development program delivered by the Canadian Northern Economic Development Agency. $70 million over three years for a new, targeted and time-limited fund to increase health services in the three territories in priority health areas and to reduce the reliance on outside health care systems and medical travel. Enhancing funding for Nutrition North Canada to help improve access to healthy food in the communities it serves. $165 million over two years on a cash basis to advance the construction of a new bridge for the St. Lawrence. $378 million over two years on a cash basis to advance the repair and maintenance of federal bridges in the Greater Montreal Area, including the Champlain Bridge to ensure it is properly maintained until the new bridge for the St. Lawrence opens. $58 million over two years to support the continued operation of the Digby, Nova Scotia–Saint John, New Brunswick, Wood Islands, Prince Edward Island–Caribou, Nova Scotia, and Îles de la Madeleine, Quebec–Souris, Prince Edward Island ferry services. $40 million over two years on a cash basis to accelerate repair and maintenance work at small craft harbours across Canada. $33 million over two years to support the divestiture of regional ports to local interests and the continued operation and maintenance of federally owned ports. Encouraging competition and lower prices by introducing legislation to cap wholesale domestic wireless roaming rates and provide telecommunications regulatory bodies with the power to impose monetary penalties on companies that violate regulatory requirements such as the Wireless Code. $305 million over five years to extend and enhance broadband internet service for Canadians in rural and Northern communities. Introducing legislation to prohibit unjustified cross-border price discrimination to reduce the gap between consumer prices in Canada and the United States. $390 million over five years to strengthen Canada’s food safety system. Developing a comprehensive financial consumer code. Eliminating the practice of pay-to-pay billing. Expanding access to basic banking services. Launching a review of the Canadian deposit insurance framework to ensure continued protection for the savings of Canadians. $44.9 million over five years to expand the focus of the National Anti-Drug Strategy from illicit drugs to also address prescription drug abuse in Canada. Expanding health-related tax relief under the Goods and Services Tax/Harmonized Sales Tax (GST/HST) and income tax systems to better reflect the health care needs of Canadians. Enhancing access to Employment Insurance sickness benefits for claimants who receive Parents of Critically Ill Children and Compassionate Care benefits. Increasing the maximum amount of the Adoption Expense Tax Credit to help make adoption more affordable for Canadian families. An additional $5 million per year for the New Horizons for Seniors Program to support additional community projects that benefit seniors. Restoring the effectiveness of the excise duty on tobacco products in support of the Government’s commitment to reducing tobacco consumption. $91.7 million over five years to enhance the RCMP’s ability to combat contraband tobacco. Introducing measures that will further reduce the administrative burden on charities, encourage charitable giving and allow charities to use modern electronic tools. $105 million per year in support of culture-related programs, $9 million per year for the Canada Book Fund and $8.8 million per year for the Canada Music Fund. $10.8 million over four years to support the efforts of Special Olympics Canada. Proposing changes to the Public Service Employment Act and the Public Service Employment Regulations to enhance employment opportunities in the federal public service for veterans. Supporting the implementation of the Canadian Victims Bill of Rights. Committing $8.1 million to create a DNA-based Missing Persons Index to match DNA from missing persons and unidentified remains to the National DNA Data Bank. $25 million over five years to continue efforts to reduce violence against Aboriginal women and girls. Introducing a Search and Rescue Volunteers Tax Credit for search and rescue volunteers who perform at least 200 hours of service during the year. The Government is on track to return to balanced budgets in 2015. Including measures in Economic Action Plan 2014, the deficit is projected to decline to $2.9 billion by 2014–15. A surplus of $6.4 billion is expected in 2015–16, after taking into account a $3.0 billion annual adjustment for risk. The federal debt-to-GDP (gross domestic product) ratio is expected to fall to 27.0 per cent in 2017–18, below its pre-recession low, putting the Government well on its way towards achieving its target of 25 per cent of GDP by 2021. The planned reduction in federal debt will help to ensure that Canada’s total government net debt burden will remain the lowest, by far, of any Group of Seven (G-7) country and among the lowest of the advanced G-20 countries. Modernizing the Government’s disability and sick leave management system. Transitioning to equal cost sharing for retired employees who choose to participate in the Public Service Health Care Plan (PSHCP) and increasing the number of years of service required to be eligible for the PSHCP in retirement from two to six years. The Government is also introducing a number of measures to improve the fairness and integrity of the tax system and to ensure everyone pays their fair share. Actions in Economic Action Plan 2014 to return to budgetary balance will produce additional savings totalling $9.1 billion over six years.